Two Atlantic Puffins watch as one of their companions opens its wing with hopes of taking flight from Bird Island in Newfoundland, Canada. As this Atlantic Puffin puffs up his feathers and spreads his wings atop Bird Island in Bonavista Bay in Newfoundland, Canada, it appears as if he is ready for flight. 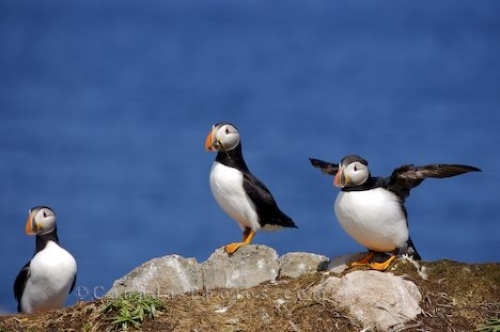 Atlantic Puffins are extremely poor fliers as they must flap their wings between 300 to 400 beats per minute to maintain flight and at times they may have difficulty even becoming airborne from the Island. Picture of an Atlantic Puffin preparing himself for flight with his wings spread out atop Bird Island in Newfoundland, Canada.